Throughout the week I read all the registration posts for my category for BBAW before voting. There were a lot, let me tell you. It took me quite awhile but I didn't want to vote until I had a look at every one. I found more blogs to add to my Google Reader. Is that a good thing?! 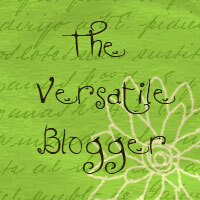 I want to thank Melanie from Read It In 7 Days for the Versatile Blogger Award. Thank you very much Melanie! I was also contacted by Emma Lee from Awarding the Web this week. My blog was voted one of the 2010 Top 50 Book Blogs on their site. I'm very flattered! I'm not sure how it works but thanks to all who voted. We're going on a little trip this week. Not quite as long a drive as last year's trip (thank God) but I'll still be driving for a few hours. I'm hoping to spend time on the beach too. So while I must make sure we all have enough clean underwear and sunscreen, a more important decision must be made: what books to bring. I'm definitely bringing the audio version of Dead Tossed Waves for the car. What about the beach? Something light and easy but able to keep me interested. I'm taking School of Essential Ingredients and Folly . Will that be enough? Not sure. I might need a couple more. Anyway I hope no one freaks out like Clark Griswald on this trip. Warning: F-bombs abound! I hope you have a great trip, but I don't think you're taking enough books! Kathy- lol! I think you might be right. I'm still thinking about what to bring. Enjoy your trip, Chris! In terms of books, light and engaging is always a great combo for the beach. And I don't see anything wrong with overpacking books--unless there's a nice little bookstore close by (not packing enough is always a great excuse to browse bookstores!). Oh Clark! :) Have a great time. Andi- I'll let you know. Trisha- Thanks. Got to love Clark.